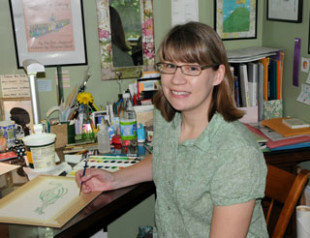 Nina Victor Crittenden sits at her home studio desk and begins to paint. Shy and modest, she’s hesitant to talk about herself, but the words come easier as she strokes her watercolor brush across the back of a flying dragon. She paints with a watercolor kit she says is “like most kids would have.” It’s the same set she used in high school. “I really like them and I’m sticking with them,” says Nina in her quiet, gentle voice, becoming more comfortable with each wash of green. Talking about her artistic process, she explains that first she sketches a small image, then scans the sketch into Photoshop and enlarges it so she has more space to work with. 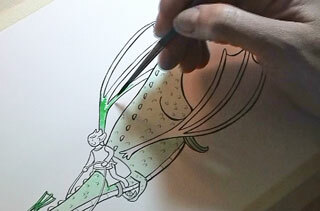 Then she transfers the image onto watercolor paper, inks it, and lets it dry overnight. Clearly, her prep for our interview was to have this image ready to paint. It’s a picture of Cedric, a young boy from her first picture book Cedric and the Dragon by Elizabeth Raum, flying on a dragon. “He didn’t get to do that in the book,” says Nina, “so I thought it would be fun for him to fly on the dragon.” As she starts to paint, the mom in her realizes she didn’t put a helmet on Cedric. “In today’s world, he probably would not be allowed to fly on a dragon without a helmet. But dragons are a pretty safe way to travel, so I think he’ll be okay,” she says, her subtle sense of humor surfacing. Cedric and the Dragon is a story about a young prince who struggles with math and reading and fails miserably at dragon-slaying school. When a dragon appears to be terrorizing the kingdom, Cedric discovers the real problem, and saves the kingdom with kindness and hugs. A delightful story on its own, the underlying theme of compassion and kindness toward others reminds young readers that everyone matters and has special talents, and there’s more than one way to address conflict. 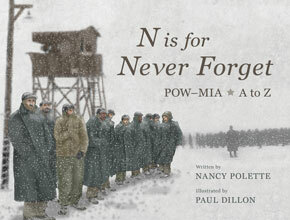 Nina was naturally drawn to the book’s message. “My husband and I have been teaching our children to treat others with kindness since they were very young. The message at the heart of Cedric and the Dragon is kindness. It was a perfect fit,” she says. Even more so, the art requirements were a dream come true. One of the revisions to Cedric and the Dragon was the interior title page illustration, a page that for some might be an afterthought. The opening scene of the book celebrates Cedric’s birth at the palace, so Nina initially drew a beautiful dragon’s egg for the title page, to show anticipation of the birth of the dragon as well. 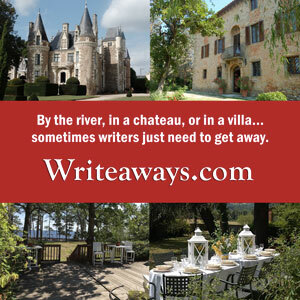 The book’s editor loved the idea of anticipation, but wanted to keep the focus on Cedric. The collaborative result: a crown on the queen’s pregnant belly brought both ideas together. 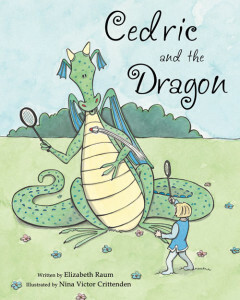 When Nina was contacted to illustrate Cedric and the Dragon, she was at the tail end of an illustration mentorship through the Society of Children’s Book Writers and Illustrators. Her mentor was the talented Christina Rodriguez, an illustrator experienced in several styles, who has won awards for her work in books like The Wishing Tree by Mary Redman and Storm Codes by Tracy Nelson Maurer. What’s next for Nina is more of what she loves most: combining her love of art and animals. She is busy submitting board book and picture book dummies to publishers. Her next published picture book, Chicken Lily by Lori Mortensen, is scheduled for release in March 2016. 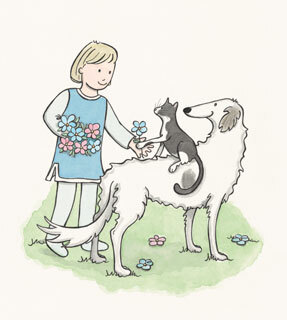 Karen Pavlicin-Fragnito is an award-winning publisher, writer, and editor who has collaborated with many authors and illustrators to create meaningful books. 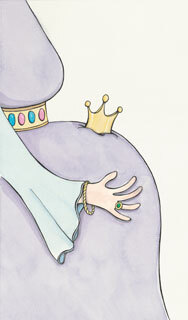 One of her all-time favorite collaborative moments was Nina’s title page illustration of the queen’s crowned pregnant belly for Cedric and the Dragon. This article was first published in November 2015. What a nice post Nina! So special.